How Long Has PreSonus Been Making Sequencers? Is Studio One the One? Fed up with Cubase? Sick of Logic? Bored by Sonar? 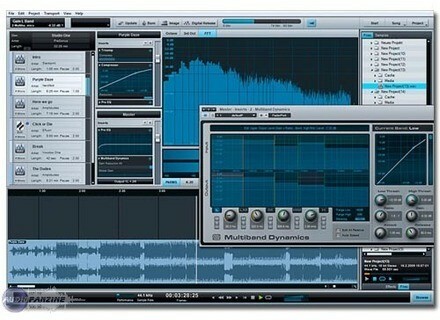 PreSonus will take back your software in exchange for Studio One. But, is it really worth it? Launching a new sequencer in 2010 is a bold venture considering that there are several well-established products out there. We could name at least a dozen top of mind, each one better than the others (Pro Tools, Logic, Sonar, Cubase, Nuendo, Samplitude, Digital Performer, Live, Tracktion, Reaper, Acid, Reason/Record, Fruity Loops, etc. ), for all sorts of applications and within all price ranges. Nevertheless, more often than not, it was unexpected outsiders that introduced innovations in the field rather than the established brands (Cubase's InLine Edition and Reason's Combinator owe a lot to Tracktion to name only one example). That's one of the main reasons why we are very pleased to welcome PreSonus' Studio One – which we hope will bring some fresh air to the sequencer world. Well-known for their FireWire interfaces (FirePod and FireBox, for example), the guys at PreSonus also offer a very comprehensive range of audio products from digital mixers to dual high-quality preamps (conceived by Anthony de Maria), headphones amps, monitoring controllers, etc. In short, almost everything you need to set up a home studio, except for microphones and monitors. In this context, a sequencer seems quite natural, all the more if you think that most leading manufacturers in the pro audio industry have their own sequencer: Cubase and Nuendo belong to Yamaha, Sonar to Roland, Pro Tools to Digidesign/M-Audio, Acid to Sony, Tracktion to Mackie, etc. Installing Studio One and the additional software tools provided is pretty straightforward and easy. Among the printed documentation included there's a short quick start guide in full color and a leaflet listing all the shortcuts. It's not much but you will also find a 189 page long PDF under the software's Help menu, and PreSonus also included a handful of video tutorials to get you started. That was nice of them, even if one the main pros of Studio One is its intuitiveness. Similar to Tracktion or Live, the software welcomes you with a dashboard where you can open or create a new song or project. Isn't a song the same as a project? Nope. A project contains a song, which in turn includes all the recording, sequencing and mixing, and it also allows you to switch to mastering mode. We will come back to this later. The start page also provides you with breaking news about the product and allows you to check for updates and optimize the audio/MIDI settings for your computer. Do note that Studio One provides ready-to-use mappings for many PreSonus control surfaces as well as for products by Mackie, Novation, Korg, M-Audio, Akai, Behringer, etc. Everything is very well thought-out and easy to configure so that you can quickly find your way through the Song interface. This is where you'll spend most of your time considering that all the tools for recording audio, MIDI sequencing and mixing are here. The layout of this section rings a bell or two: the arrangement window takes up two thirds of the screen and is surrounded by a track inspector – like in Cubase – on the left side, a preset/song/plugin browser – like in Ableton Live – on the right and a multifunction window on the bottom side, which displays either the virtual mixer, the MIDI/audio editor – like in Live –, or the mixer – like in Reaper. You experience a sort of deja vu as you discover the software's details but it's not easy to pinpoint exactly where a design idea comes from. Nevertheless, you will have no choice but to accept that the developers made the right choices and it will allow you to start working right away without having to open the user's manual. All the tools are easily accessible and their use is pretty obvious. The software is quite comprehensive, considering that it's a first. It is very clear and simple. Most common sequencers have lost this simplicity and become more and more complex with every update. Apart from the possibility to drag & drop presets, plugins and samples, you'll will surely enjoy the simplicity with which you can automate every single parameter – be it of the software or a plugin –, route a track to an auxiliary bus or to the side chain input of a compressor. While browsing through the different contextual menus or dedicated graphic interfaces, you'll discover that, compared to other well-established DAW tools, Studio One is not as limited as you thought in first instance: direct monitoring management, audio/MIDI quantize and humanize functions, loop recording management... It has all the basic functions! Same thing regarding effects – there is an effect for almost every imaginable application. Besides relatively good flanger, phaser, distortion, filter, tremolo, and amp simulation effects, you'll also find everything you need for a mixdown: a channel strip, compressor, expander, limiter, 5-band parametric EQ + low/high cut, noise gate, spectrum and phase analyzer, guitar tuner, stereo enhancer, MS encoder, and even a tool to manage an external hardware processor... As for spatial effects, you'll also find two very good sounding reverbs and three delays, as well as the remarkable Room Reverb which is much more convincing than many plugins provided in way more expensive sequencers. The software has a very convenient function that allows you to save complete and ready-to-use effect chains with as many plugins as you wish. While Studio One effects are pretty good, the virtual instruments are much less exciting: Impact is a drum sampler that recalls a primitive version of Steinberg's GrooveAgent, which is in turn a basic FXpansion Guru; it provides 16 pads assigned to one sample each with three AD envelope sections (pitch, filter and amp). Impact allows you to create nice grooves using the several drum kits provided, but don't expect too much (for example you can group several pads but each pad has only one layer and it is not possible to set rules among pads like in Battery where a closed hi-hat can mute an open hi-hat). Presence is a Soundfont-compatible sample player that includes a universal sound bank comparable to the one in HALion One, provided with Cubase 5. SampleOne is a very basic sampler to edit sample banks... but it doesn't support any standard format on the market. Bummer! Nonetheless, we would like to mention that the software is sold with a nice library of ready-to-use loops of different instruments and for diverse music styles. They are certainly interesting and compensate for the poor performance of the virtual instruments. Here are a couple of samples based on three Presence instances (bass, pizzicato and syncopated pads), one Kore Player synth and a drum loop, so you can make up your own opinion... We also used a sidechain compressor on the bass track, a sequenced filter and delay on the pad, Red Led, and... that's me and Jess' on the mic.